This list has been compiled and provided by the Rushden Council of Churches. Rev. G. T. Barber, The Vicarage, Wellingboro' Rd. Tel. 2849. Captain Boniface, 139 Hall Avenue. Tel. 3528. Pastor Boston, 25 Purvis Road. Tel. 2912. Rev. D. J. Elliott, The Rectory, Rectory Road. Tel. 2554. Church of England (St. Mary's). Rev. H. Gibson, Wesley House, 51 Park Road. Tel. 2778. Rev. J. Goulder, The Manse, 161 Wellingboro' Rd. Tel. 2919. Rev. J. H. Harris, 1 Hayway. Tel. 3649. Roman Catholic Church (St. Peter's). Sister Le Lerre, 17 Church Hall Road. Tel. 4085. Rev. L. R. Misselbrook, The Manse, Park Road. Tel. 2426. Rev. D. Price, The Manse, Highfield Road. Tel. 3493. After-Care Committee. Mrs. H. Wood, 25 Moor Road, Rushden. Tel. 3417. Alcoholics Anonymous. Central Service Officer, A.A., c/o B.M./A.A.L., London. Tel. 01-493-4939; 7-9.30 p.m. FLA 1626. Blind Welfare. Miss E C Laurenson, Health Clinic, 18 Oxford Strt, Wellingboro. Tel. 2035 Ext. 2. British Legion. Men's Section: Mr. J. T. Waplington, 57 Prospect Avenue, Rushden. Women's Section : Mrs. M. Scott, 75 Upper Queen St., Rushden. Dental Surgeons. G. S. North, G. S. Osborne, D. G. Mason, A. J. McGregor Tel. 2256, R. W. Hobson, I. S. Appleyard Tel. 2992. District Medical Officer of Health. Dr. J. C. Maclnnes, County Offices, Guildhall Road, Northampton. Tel. 34883. Family Planning Association. Infant Welfare Centre, 67 St. Giles' Street, Northampton. Tel. 38806. (Mondays 6 p.m. to 8 p.m. - not August or December). The County Family Planning Clinic, Infant Welfare Clinic, School Lane, Kettering. (5.30-7.30pm second Thursday in month. 9.30-11.30 a.m. third Thursday in month). Gamblers Anonymous. 19 Abbey House, Victoria Street, London, S.W.I. Tel. Abbey 4252. Health Visitors. Mrs. J. Alletson, Miss M. Fitzmaurice, Miss A. Mair, Miss Morris-Hilliard. Health Clinic, Rectory Road, Rushden. Tel. 2957. Home Help Enquiries. Mrs. M. F. Hager, Health Clinic, 18 Oxford St, Wellingboro'. Tel. 2307. Hospital Contributory Fund. Free Gardeners, Portland Road, Rushden. Housemartins Over Sixty Club. Mr. C. M. Berridge, 459 Newton Road, Rushden Tel. 2852 Alternate Thursdays at 3.30 p.m. at 459 Newton Road. Infant Welfare Centre. Health Clinic, Rectory Road, Rushden. Tel. 3008. Legal Aid. Mr. E. W. Jarman, The Law Society, 10 Salisbury Road, Leicester. Tel. Granby 747. Or any local solicitor. Marriage Guidance Council. 73 St. Giles' Street, Northampton. Tel. 34400. Norwich Union Buildings, Market Place, Kettering. Tel. 4249 Appointments Secretary: Tel. Northampton 34400. Meals on Wheels. Mrs. A. Perkins, 98 Wymington Road, Rushden. Tel. 2891. Medical Comforts. Mrs. I. Smith, 17 Denmark Road, Rushden. Mental Health Service. Welfare Officers:-During Office hours Tel. Northampton 34833. After Office hours Tel. Northampton 36633. Mentally Handicapped Children. 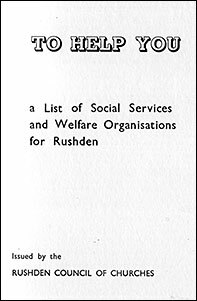 Rushden Association. Mrs. W. Perkins, 46 Irchester Road, Rushden. Ministry of Social Security. 20/28 Wood Street, Northampton. Tel. 35684. National Society for the Prevention of Cruelty to Children. Insp. K. Cue, 169 The Headlands, Northampton. Tel. 31661. National Society for Cancer Relief. Mrs. M. E. Jones, 150 Irchester Road, Rushden. Police Station. North Street, Rushden. Tel. 3054. Prisoners' Aid Society for Northants. 23 Princess Street, Northampton. Tel. 37397. Probation Office. 18 Oxford Street, Wellingborough. Tel. 3384. Registrar of Births, Marriages and Deaths. Mr. M. L. Gibson, Health Clinic, Rectory Road, Rushden. Tel. 3008. Royal Society for the Prevention of Cruelty to Animals. Inspector. 9 Westhill Close, Kettering. Tel. 3290. Rushden Tuberculosis After Care Committee. Secretaries: Miss A. M. Sharwood 57 Park Avenue, Rushden. Tel. 2159 Mrs. H. Wood, 25 Moor Road, Rushden. Tel. 3417. Rushden Medical Centre. Drs. Lean, Cunningham & Lumb. Tel. 4836. Drs. Paine, Clarke & Brook. Tel. 4849. Drs. McKendrick Smith & Haddon Tel. 4829. Appointments Tel. 4537 or 4538. Senior Citizens' Goodwill Committee. Mr. A. G. Crowdy, Council Buildings, Rushden. Tel. 2227. St. Crispin's Townswomen's Guild. Mrs. Case, 8 Portland Road, Rushden. Tel. 2343. St. John Ambulance Division. Mr. D. Porter, 136 Newton Road, Rushden. St. John Nursing Division. Supt. I. Smith, 17 Denmark Road, Rushden. Toc H (Women's Section). Tuesday Group - Mrs. F. Head, 12 Purvis Road, Rushden. Wednesday Group - Mrs. M. Sharpe, 183 St. Margarets Avenue, Rushden. Welfare Officer. Mr. M. L. Gibson, Health Centre, Rectory Road, Rushden. Tel. 3008. W.V.S. (Women's Voluntary Service). Mrs. A. Perkins, 98 Wymington Road, Rushden. Tel. 2891. Youth Council, Rushden. The Supervisor, Moor Road Youth Centre, RushdenTel. W'boro 2079. Youth Employment Bureau. Rectory Road, Rushden. Tel. 3553.
your own Doctor or from The Council Buildings, Tel. 4531/3.